Cleopatra’s Needle is an increasingly popular attraction in the heart of London, England. The popularity of this structure stems from its history. 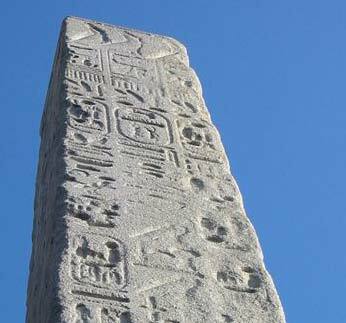 As the obelisk originates from Egypt it features many ancient hieroglyphs. The obelisk was presented to the city of London in 1819. However, it stayed in Alexandria, Egypt for approximately 60 years. The reason that the government chose to leave it in Egypt was the cost of transportation. Bringing the structure to the UK would cost 10,000 pounds. Thankfully, a local philanthropist footed the bill. During the journey to London, there was a storm. This storm caused the structure to capsize. Unfortunately, this accident killed six members of the crew. These crew members are listed on a plaque at Cleopatra’s Needle. The obelisk was taken to Spain for repairs. It eventually arrived in London in 1878. The needle is made out of red granite and stands at approximately 68 feet tall. It weighs 180 tons. The structure originally came from an ancient city called Heliopolis. It is believed that the structure was erected by the order of the Pharaoh Thutmose III. Experts believe this happened around 1450 BC. Tourists may be surprised to learn that there are three obelisks which are currently known as “Cleopatra’s Needle.” The other two structures are located in Paris and New York City. The obelisks presented to London and New York City are from the same site in Egypt. In 12 BC the structure was moved to a temple that was built to honor Julius Caesar and Marc Antony. Later, the obelisks were toppled and covered in sand. This aided their preservation. Two bronze sphinxes sit on each side of the obelisk and the sphinxes bear an inscription which honors the Pharaoh Thuthmosis III. The embankment where the obelisk is placed is adorned with Egyptian-style decor. Additionally, one of the sphinxes has visible damage from a German bomb in World War I. The obelisk in London is covered in ancient Egyptian hieroglyphs. Researchers believe that these were added to the obelisk 200 years after its creation by Ramesses II. The images depict his military victories. London is a city full of sights and attractions. Due to the age of the city, it houses many monuments that some considered to be more important than Cleopatra’s needle. First-time visitors on a tight schedule will need to decide whether visiting the needle will mean that they cannot see another attraction. If so, tourists will then need to determine whether or not visiting the obelisk is worth their time. As the obelisk is not part of a museum, tourists can drive to the structure and view it within a short amount of time. Those without a car can take the tube. Another option is to take a city tour which includes the obelisk. City tours are an excellent way to see a lot of London in a short time period.